New Christian Hip-Hop club meets every Sunday at 8 p.m. in Brandon at the Boomerang Martini Club. 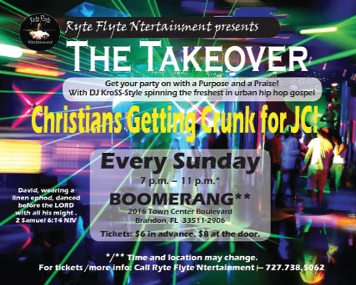 Christian rappers and hip-hop dancers stage a Takeover every Sunday night at Boomerang Martini Club in Brandon. Organized by Wanda Wright of Thonotosassa, the Takeover is emceed by a Christian DJ, who introduces popular Christian rappers like Shonuff, Tiger “the Hope Boy,” and Brilliance, as Christian clubbers hit the floor to dance the night away. Organizers research the rappers’ Websites, determine if they are quality Christian rappers and schedule them for an upcoming performance. “We’ve even let some rappers perform the very night they came to us,” said Wright. Wright first envisioned the idea when she heard hip-hop music being played in a church, and she immediately knew God was leading her start a hip-hop night at a local club. “I realized Christians from different backgrounds and different churches need a place to come together and really enjoy themselves,” she explained. Through a contact at Boomerang Martini Club in Brandon, Wright was able to make arrangements with the club owner, and the first Takeover Christian hip-hop night was held in February. That first night of the Takeover, there were more than 40 people of all ages in attendance. During the Takeover, there’s no explicitly stated dress code or dancing limitations, but attendees are expected to be respectful of each other and the Christian faith. Only non-alcoholic beverages are available at the club during this event. The hip-hop party meets every Sunday evening, 8 p.m.– midnight, at Boomerang Martini Club, 2016 Town Center Blvd.in Brandon. For more information, please call 655-1700. Jessica is a freelance writer for the Osprey Observer and Christian Voice newspapers. She has a BA in Journalism from the University of West Florida and 7 years of experience writing for various publications. She’s the owner of Accuracy Editing, a 2-year-old company committed to helping small businesses and individuals improve their written communication.